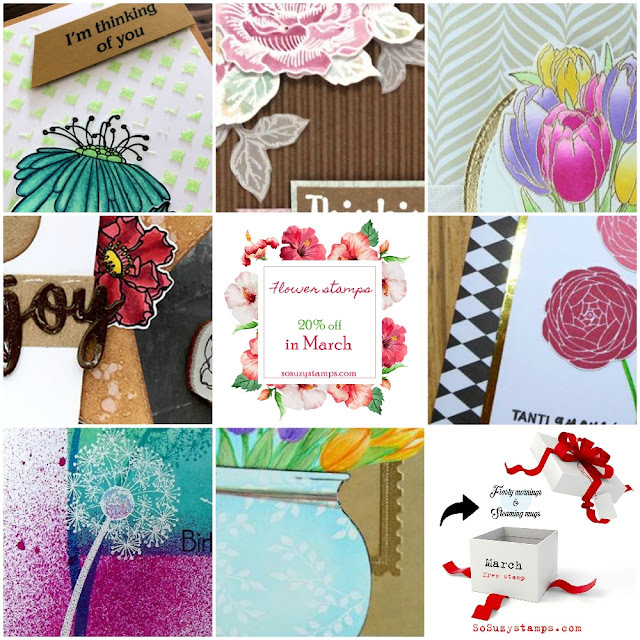 Good morning, and welcome to our Spring has Sprung Design Team Blog Hop. You are sure to find something to love here to enjoy our March Promotion with Flower Stamps 20% off. Our designers have done an amazing job with their projects. We are always impressed by their skills and creativity! To celebrate this blog hop, So Suzy Stamps is giving away a $20 gift certificate to ONE lucky winners! Please leave a comment HERE on So Suzy Blog and Designers Blogs by Monday, March 12th at midnight for a chance to win. ONE winners will be announced on the So Suzy Facebook Page on 3/15/2018. So Suzy Stamps - YOU ARE HERE!!! Thanks for a great hop. Enjoyed the fabulous inspiration from the designers. Thank you for visit us. I hope you found inspiration and enjoyed the hop. A big hug! So excited to see all the beautiful inspiration! Such BEAUTIFUL AMAZING Cards! I am Loving all of the flowers! Looks like a lot of great stamps for Spring projects. Off to hop and be inspired. Such talent! All of these cards are beautiful! I enjoyed all the beautiful creations along the hop! Lovely flowers along the way! I love blog hops, so many wonderful shared ideas and created little works of art. Thank You. it was a super inspiring hop! full of beautiful cards!